Decorative Life: Lasts 2-4 weeks or more depending on environment. Plugs can be stored for 2 weeks in the dark (3 weeks in light) at 55F and subsequently grown into very acceptable plants and/or flowers. High nitrogen levels during production, especially in the ammonium form, can reduce postharvest performance. Ethylene applications in the form of Florel sprays (biweekly applications at 400 ppm) can prevent flower formation on stock plants which in turn results in increased cutting number and subsequent rooting. A very large genus with over 1000 species. Will generally do well in light levels at least bright enough to read a newspaper in comfort but more light would be better. Consumers prefer bicolors over solid flower colors, red over pink and blush, red or variegated foliage over solid green and solid red over variegated foliage. Some favorite cultivars and their respective flower colors include ‘Cajun’, ‘Paradise’, ‘Pure Beauty’ and ‘Harmony’ series, all with many colors and bicolors, ‘Ovation Red’, and ‘Rhapsody’ (purple). The following cultivar series come in almost all colors: ‘Paradise’, ‘Pure Beauty’, ‘Pizzazi’, ‘Baby Bonite’, ‘Electra’ and ‘Tioga’. 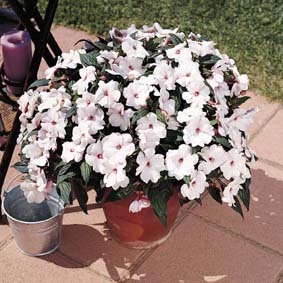 ‘Tioga’ is a double impatiens. Ter Hell and Hendriks (1995) noted that high levels of ammonium fertilization during production caused increased abscisic acid and decreased cytokinin levels resulting in increased bud drop and root damage after harvest.